When it comes to training your sales staff, regardless of how good the closing technique is, it only works when the salespeople use it. On a retail sales floor, a majority of the time, the customer does the work to close the sale instead of the salesperson. 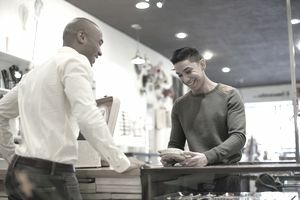 Typically, a salesperson stands at the sales counter and waits until the customer finishes looking at the merchandise and says, "okay, I'll take this one," which is clerking, not selling. This is reinforced by the lack of a commission structure in many retail stores, and workers do not have to be professional salespeople to make a living in retail, especially when the customer does all the work. The internet has made things even more challenging. It's very easy for a customer to come into your retail store after having done all of her research online, and your sales staff just rings up the sale without the need to apply any sales tactics. The assumptive selling technique, also known as a presumptive close, takes place when a salesperson intentionally assumes that the customer has already said yes to the sale. For example, an assumptive statement from the salesperson might be "give me your credit card and I'll get the paperwork started." The assumptive close works well because it comes across as professional and is used as part of an intentional sales process. To implement it effectively, you must have a clear understanding of the customer's needs and desires beforehand. If you have listened well and matched the customer up with the perfect product or solution for their needs, then there is nothing more to discuss with the customer, except for how they intend to pay for their purchase. When you or your sales force implements closing techniques, this can result in more revenue, more effective staff and happier customers. A good close is part of an overall well-designed sales process, where the salesperson listens well and matches customers up with products that genuinely suit their needs, rather than pushing products for which customers have no real use or desire. A variation of the assumptive close is sometimes used, and it's called the Secondary Question close. In this scenario, the salesperson asks the customer whether they would like the product package A or package B. For example, would they like the basic skin care set or the set that includes the anti-aging serum? If the customer answers the second question, then the first question, do they want the product, is already answered. This technique does not ask whether the customer wants the item or not, it only asks which variation of the item the customer wants. Ultimately, as a salesperson, the job is to ask for the order. To assume the sale, you can start with a lead-in phrase like "Since we've agreed..."
Words such as these make sense because you have been preparing the customer for the close the whole time, by using other sales techniques like tie-downs and benefit statements. The entire sales process should have consisted thus far of confirming and gathering agreement from the customer to verify that you were on the right track. So when it's time to close, you are simply recapping everything you and the customer have already agreed upon. After your initial phrase, next list the key benefits you covered in your sales presentation. Try to keep this to three or less, because too many will make the decision seem bigger than it truly is, and there is a point of diminishing return on features and benefits. Avoid the trap of thinking that more features equate to a better deal. Most customers will only use a small percentage of the available features on any product they buy. If you can nail those 15 percent, then you are on your way to a successful close. Feature the benefits that mean the most to the customer, not to you. Salespeople might be excited about a new technology and go on and on with a customer about it, while the customer could care less. Sell only the features the customer wants and then close through an assumptive sales process on only those benefits. To use the secondary question close, first state the customer's main decision in terms of benefits to them. Don't allow a pause in between the benefits statement and your secondary question. Phrase the secondary question as two product choices, each of which moves you closer to closing the sale, while keeping your attitude helpful yet casual.